It’s the British Academy Film Awards this weekend, on Sunday February 10th, presented by Joanna Lumley. The BAFTAs are often a great precursor to the Oscars and predicting them is good practice, though the winners frequently lean a little more to this side of the Atlantic. Here’s this year’s ballot sheet PDF for you to have a go at predicting the winners and challenge friends and family to do the same. My predictions are below, though I haven’t seen most of the nominees so some are guesses based more on what I’ve heard from others rather than what I thought of the films myself and I have missed a couple out because I have no idea whatsoever. 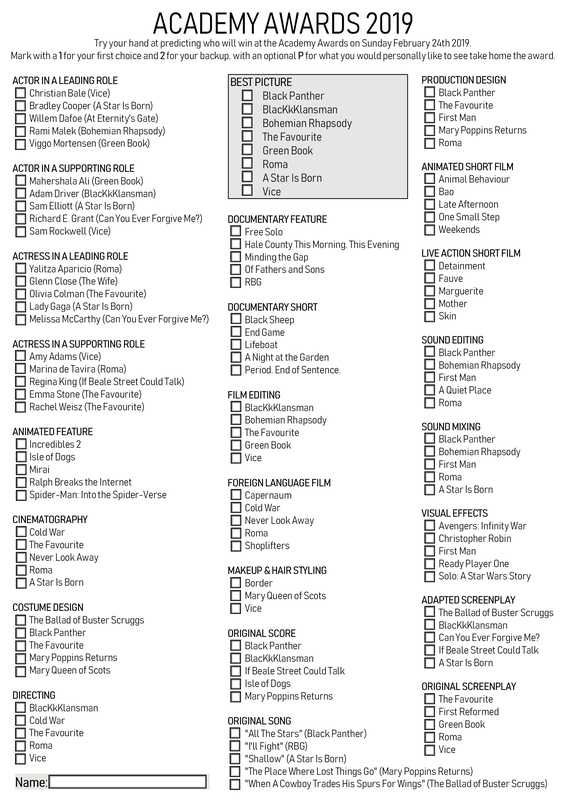 I may adjust a few of these if I see a film that sways my opinion before the awards are given out. 1. THEY SHALL NOT GROW OLD Peter Jackson – I’m not sure I’ll get to fully review it but I saw this and it was very good indeed. The technical skill involved in restoring, colourising and syncing sound to the archive footage is outstanding as well as the way it takes its time to show and listen to accounts of WWI. It’s an impressively made documentary that held my interest and did something new with the footage and recollections of the soldiers, a very likely winner for BAFTA. 1. RICHARD E. GRANT Can You Ever Forgive Me? 2. MARY POPPINS RETURNS John Myhre, Gordon Sim – Review coming soon. 2. MARY POPPINS RETURNS Sandy Powell – (My review is coming soon). BARRY KEOGHAN – Mainly known for his role in ‘Dunkirk‘.